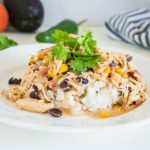 Instant Pot Fiesta Chicken is one of the easiest recipes to make! It's simply dump, done, and eat. No need for extra prep or steps! And, in less than half an hour, you can have a hearty and delicious meal that is perfect served over rice, eaten in tortillas, or even as a nacho topping! Close Instant Pot and set to sealing position. Select manual high pressure (the manual button or the pressure cook button on the newer models) and set timer for 25 minutes. When Timer is up, allow for a natural pressure release. Pull chicken out and shred. Return chicken to pot and stir. Serve over rice, if you choose, and enjoy!